Potatoes, garlic and herbs are abundant. Beaverdale Farmers Market’s many produce vendors are situated along the north side of Urbandale Avenue and bring a variety of greens, beans, tomatoes, zucchini, melons and root vegetables. Some vendors have peaches and berries, too. 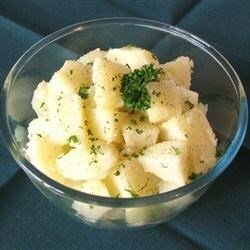 Enjoy potatoes from the market with an easy potato salad, made with vinegar rather than mayonnaise.